Someone once asked us how we choose the things we do in the various places we visit. In some ways, I think that question has it backwards; the things we do largely choose us. We’re fortunate in that we really do enjoy most activities and environments. In cities we’ll busy ourselves with architecture, museums, culture, and history. Elsewhere we’ll go hiking, or caving, or kayaking, or, really whatever happens to seem interesting at the moment. In short, we’ll do whatever there is to do in whatever location we happen to be. More than us choosing things to do, we mostly let each destination decide for us. That is precisely how we ended up standing in front of a pink house at 3319 E. 1st Street, in Long Beach, CA. 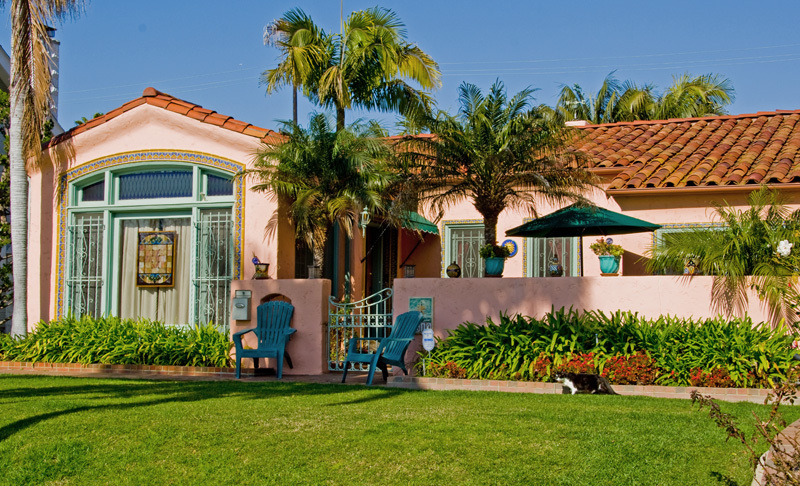 Dexter’s and Rita’s humble Miami abode, right here in Long Beach, CA. It’s not that we’re particularly star struck. Over the course of a decade living in Manhattan we have stumbled across more than our fair share of celebrities and film sets. Back home, they’re just part of the background noise; no different than the Empire State Building. But as tourists in Los Angeles? They’re an attraction. We’re not paparazzi, though. We really have no interest in shoving our camera in people’s faces or pestering folks for autographs. But when we discovered that several filming locations for Showtime’s critically acclaimed, and pretty freaking fantastic, television series Dexter were within walking distance of our campground, seeing them felt like kismet. Finding their exact location was not. For that we turned to the insanely detailed (and I mean, really, truly insane) website Seeing-Stars.com. Those good people have somehow uncovered a ridiculous number of Dexter shooting locations around the L.A. area and organized them by season as well as by theme. It’s clearly a pursuit of passion; one that might be considered twisted if stalking a fictional serial killer wasn’t such an obviously benign hobby. Their hard work directed us to Shoreline Village, a colorfully quaint shopping center, boardwalk and marina that was worth a stop even if Dexter had never darkened its brightly hued doors. But he did, and more than once. 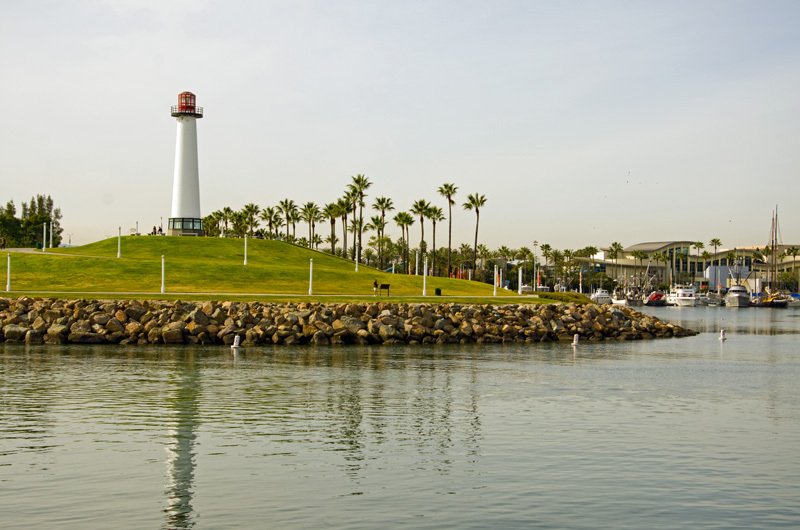 Shoreline Village provides the setting for Santa’s Village where the Ice Truck Killer leaves behind neatly wrapped packages in Season 1; a boardwalk café in Season 3; a comic book store murder scene and a lighthouse backdrop – both in Season 2. Our favorite find involved a bit of serendipity. We’re watching the series on DVD and just caught up to season six (ahem, so no comments about season seven, please). As we’re watching we recognized a similarity between a building we passed a dozen times and one that makes several appearances on the show. 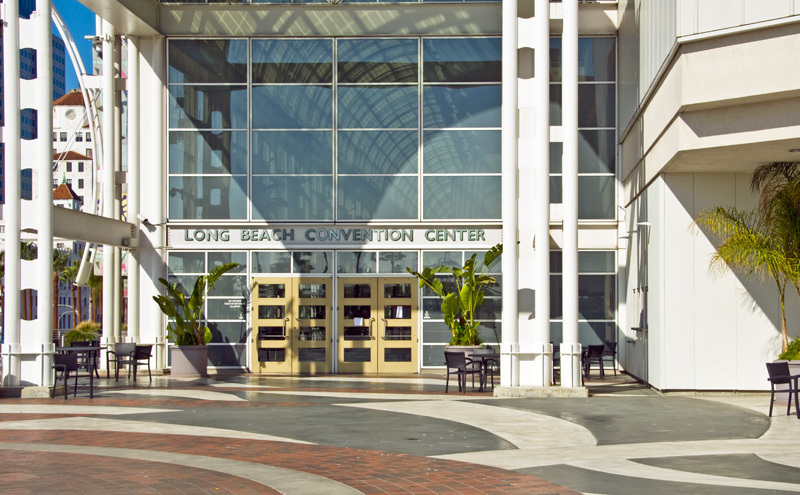 Sure enough, Dexter’s film crew transformed California’s Long Beach Convention Center . 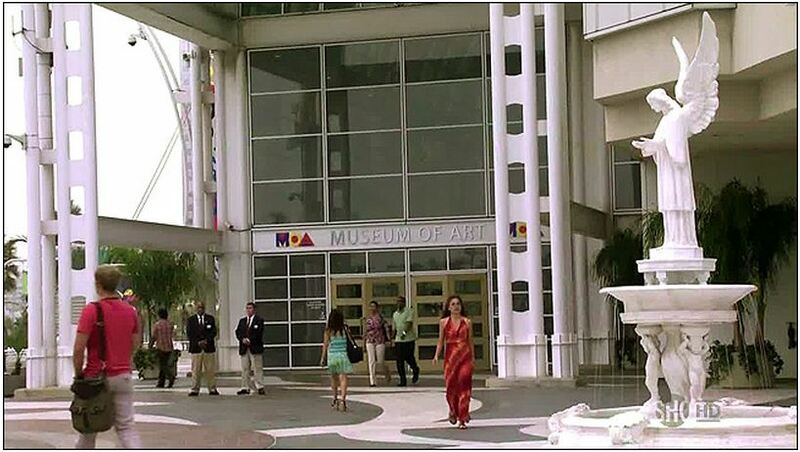 . .
into the fictional Miami Museum of Art. They changed the signage and added an angel statue, but other than that it is the same location. And about that pink house. 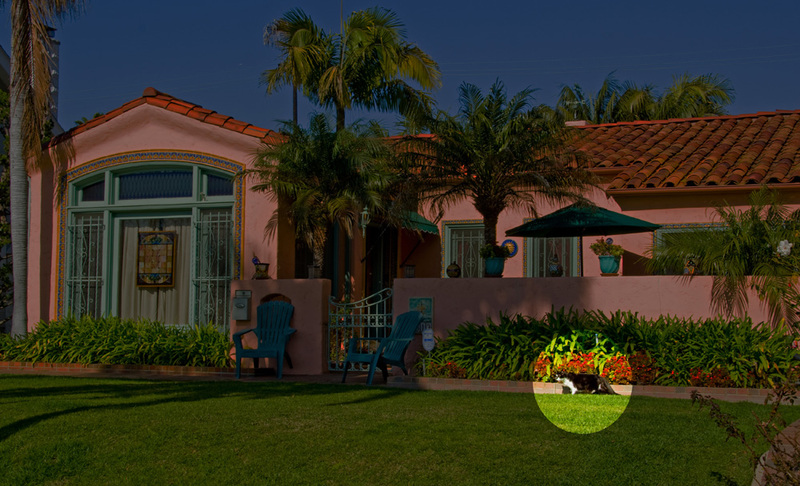 Neither Dexter nor Rita lives there anymore. That honor apparently belongs to a patient elderly couple who graciously ignored us as we photographed their property. Which reminds me: Do you think the tabloids would be interested in shots of an unclothed feline taken surreptitiously at a Dexter filming location? No? Well, like I said, paparazzi we are not. 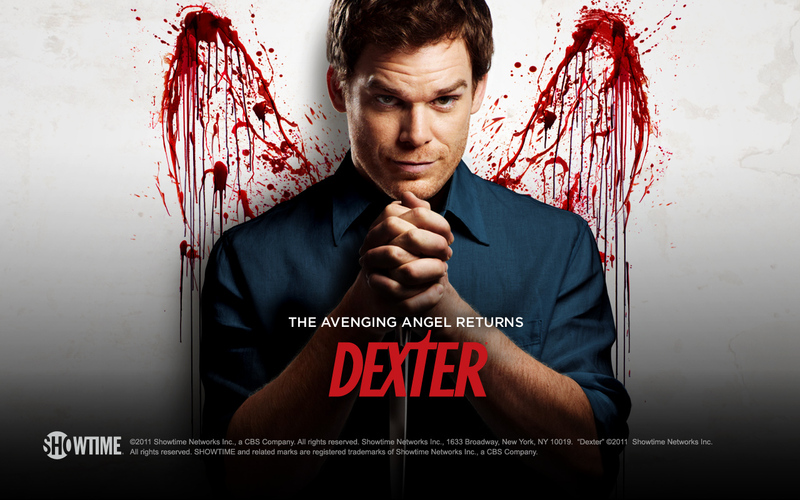 I love Dexter! I would be squeeling with excitement if I was there! It was pretty awesome to be on Wisteria Lane from Desperate Housewives a few years ago, although that was part of Universal Studios. Not quite the same!